Dental implants have become the option of choice for patients who have missing or badly decaying teeth. 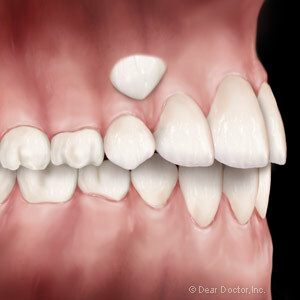 They are tooth replacements that are rooted in the mouth so they cannot be removed like dentures and bridgework. Explore these three ways that getting dental implants from Layton dentist Dr. Steven Christensen, DDS can change your life in a positive way. When you have missing or decaying teeth it's difficult to really enjoy eating your food. Every time that you bite down you either feel pain or get large pieces of food lodged between your teeth. When you get dental implants, you can once again savor your food without the worry of pain or discomfort. You can relax and chew each bite. One major benefit of getting dental implants from Layton dentist Dr. Christensen is that they improve the overall appearance of your smile. Not only do they give you the perfectly filled smile--they also help keep it looking bright and beautiful. When you go in for your tooth implant consultation, the dentist will carefully match the restoration to the color of your current teeth and shape it to perfection. Another way that getting dental implants can improve your life is by giving you a brand-new opportunity to take care of your teeth the right way. It builds your self-confidence to know that you have a fresh start with real teeth of your own. You can treat your new smile like you were born with it and with proper care it will last for a lifetime. Getting tooth implant can be life-changing in a number of ways. Request a consultation with Layton dentist Dr. Steven Christensen, DDS of 4DentalHealth today and soon enough your smile will “speak for itself.” You can set up an appointment online at http://www.4dentalhealth.com or by calling 801-889-1044 to talk to an office staff member.